BBC News looks back at some of the stories making the headlines in the South East over the past week. Sussex Ambulance saw a six-fold increase in calls for help in the early hours of New Year's Day, with extra staff having to be drafted in, it announced on Monday. The service dealt with 1,000 emergency calls, with 183 being made between midnight and 0200 GMT, compared with an average of 30 on a normal night. Sussex Ambulance NHS Trust said most of the calls were alcohol-related, and that longer licensing hours may have been to blame. 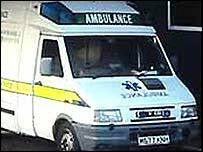 Kent Ambulance also recorded an increase in call-outs, with 1,100 999 calls being made. A housing association apologised to a mother and her three children who had no hot water or heat during Christmas. Sharon Tasker's boiler broke on 24 December at her home near Brighton. She was given fan heaters and told it could not be mended until the new year. The Guinness Trust explained on Tuesday that the part needed to mend the boiler was not available during Christmas. A spokesman apologised to the Sussex family and said the boiler would be repaired as soon as possible. It emerged on Wednesday that the families of five teenagers killed in a car accident in East Sussex had held a meeting with the Independent Police Complaints Commission (IPCC). Kelly Goring, 17, Daniel Carwardine and Danielle Martin, both 16, Barrie Mackay, 15, and Lee Morgan, 14, died in the crash in St Leonards in October. They all lived locally and were in a stolen car which crashed into a wall. The IPCC said it was confident its investigation into the accident would be concluded early in 2006. A boy from Surrey whose eyesight was damaged when he looked at an eclipse of the sun was told on Thursday there would be new official warnings as a result. Conor Howard, 10, from Cranleigh, was partially blinded in one eye after looking at the annular eclipse last October at St Nicolas Primary School. His parents said the school should have done more to protect his safety. Chief Medical Officer Professor Sir Liam Donaldson promised to help prevent it happening again. On Friday, a performance artist completed a 60-mile crawl from London to Canterbury Cathedral, in Kent, during which he had aimed to highlight loneliness. Mark McGowan, 37, was greeted by Canon Ron Diss outside the cathedral. He crawled inside and then down to a chapel before laying a rose at the shrine to Thomas Becket. Mr McGowan described his 11-day pilgrimage as having been like his own "little Everest". "Even though I looked ridiculous crawling along, it's a serious message and people were very friendly," he said.